Carole Horlock's 2008 pregnancy -- triplets for a Greek couple. 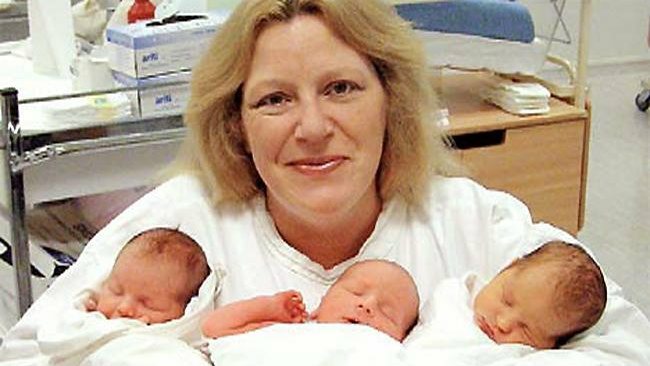 British woman Carole Horlock, 49, plans to retire from a long and prolific career as a surrogate mother. After bearing 13 children for other people from 9 pregnancies, she holds the world record for surrogacies. But her current pregnancy is going to be her last. Ms Horlock married at 21 and had an unplanned daughter of her own. But she walked out on her husband because he was not involved enough in the child’s life. A second daughter came from another relationship. Then, in 1995, while working in a launderette, the idea of surrogacy came to her. “I was never going to change anybody’s life working in a launderette but becoming a surrogate has enabled me to look back and think I’ve done that and helped so many couples,” she told the Sun. Some of her partners (the newspapers are discreet about how many) were uneasy about surrogate pregnancies. Her current partner, Paul Brown, is very supportive, but an accident in 2004 nearly ruined their relationship. She discovered that Baby Number 9 was Paul’s child, not the commissioning father.